The Lynden Sculpture Garden may be reached via I-43, exit Brown Deer Road. Head west on Brown Deer Road (Hwy 100) for approximately 0.8 miles. The sculpture garden is located on the left (south) side of Brown Deer Road. Enter through the west gate. This is the entrance closest to the barn and immediately opposite the westbound left turn lane on Brown Deer Road. 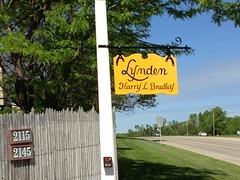 There is a small sign hanging from a lamppost at this entrance that says "LYNDEN. Harry L. Bradley." Our (small) sign. That's Brown Deer Road to the right of it.